Earlier this year, we kicked off a campaign for the Fair Lending Act (SB2843), which caps interest rates on car title loans at 36%. Car title loans prey on Illinoisans with crippling interest rates as high as 360%. These loans trap consumers in debt they can’t repay, and as a result, thousands of people lose their car every year, a critical source of transportation to school and work. In Illinois, about 10% of individuals who take out a title loan end up losing their car. Our 2015 report on title lending documented the abuses of these loans. One borrower featured in the report owed more than $15,000 dollars for just $2,500 in title loans. Twenty eight states, including nearby Indiana and Michigan, either cap interest rates at 36% or less, or ban title loans altogether. It is beyond time that Illinois follow suit. The Fair Lending Act (SB2843) was introduced in February, spearheaded by Sen. Kimberly Lightford and Rep. Christian Mitchell. It has gained significant support in its first year, with 24 Senate cosponsors and nearly 30 community organizations, veterans groups, and national organizations in support. Download the fact sheet to learn more and see the list of supporters. The campaign also received attention in the media, including pieces by WBEZ, NBC, NPR Illinois, WCIA, and others. Despite all of the momentum we gained, the bill did not have enough support to move forward this year. The title lending industry does not want this bill to pass. 300% interest rates generate hundreds or even thousands of dollars in profit for the industry on every single loan. We will keep fighting for a 36% interest rate cap, so that interest rates for Illinois title loans are fair. We will be working with our coalition partners to advance the campaign in the coming months. We need more organizations pushing for fair interest rates! Sign on in support of the campaign as we continue to move forward. Do you have a story to share about an experience you’ve had with a title loan? If you have lost your car, face financial hardship due to an auto title loan, or have had any other type of negative experience with auto title lending, email Jody if you have a story you want to tell. We want to hear from you! 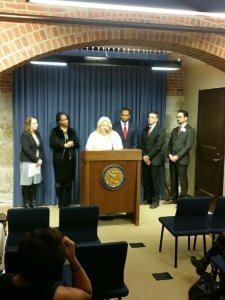 The Fair Lending Act steering committee includes Illinois People’s Action, Illinois PIRG, the Chicago Urban League, the Shriver Center, AARP Illinois, Reimagine Illinois, and the Woodstock Institute. We are grateful for their ongoing commitment to this campaign.